Embattled Senator Dino Melaye representing Kogi West in the National Assembly has accused Senator Oluremi Tinubu of doling out N75m to women activists to protest against him tomorrow in Abuja. 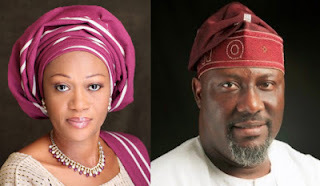 In a post on his facebook titled: ‘Tinubu plans anti-Melaye protests in Abuja, splashes N75m on Kemi Nelson, others,’ Melaye accused Senator Tinubu representing Lagos Central of doling out N75m to sponsor anti-Melaye protests in Abuja on Wednesday. “We have it on good authority that N75 million has been released by Senator Oluremi Tinubu to Kemi Nelson through Tinubu’s sister called Funlola. The money is to organise a protest in Abuja on Wednesday against the chairman, Senate Committee on the Federal Capital Territory (FCT), Dino Melaye, with 1,000 protesters from Lagos. ”The protesters have booked for 300 rooms in some in hotels in Abuja. Why did she not organise a protest against the hardship of Nigerian women and widows. As we speak, Alade market in Ogba area of Lagos has been destroyed and all the women rendered shopless. Oluremi Tinubu did not organise protest about that. ”Against the provisions of the constitution of the All Progressives Congress (APC), Kemi Nelson doubles at the State APC Women leader in Lagos and also the zonal women leader of APC in the South West. This will show her greediness and why the Tinubu dynasty has taken over Lagos. ”Women were killed in Kano and Abuja and Mrs. Tinubu is the chairman, Senate Committee on Women Affairs. She did not organise protest over these killings. Mrs. Tinubu has not protested against the skyrocketed price of tomatoes in the market. In the same vein, kerosene is now over N200 per litre and she didn’t organised any protest to that effect. ”Instead, she has taken advantage of the prevailing poverty in the land to hire hungry women in the land to partake in an unproductive protest against Dino Melaye. Women like Funmilayo Ransome Kuti, Hajiya Gambosa Sawaba, Sarah Jubril, fought for woman race without attacking any man. Oluremi Tinubu should emulate the likes of Margaret Thatcher, Indira Ghandhi, Benazir Bhutto and our own dear Dora Akunyili.